An excellent recording by the many-time All-Ireland champion, lead by Co. Kildare flute player Eugene Nolan. Tight playing, as one would expect, fiddle-driven (5 fiddles, 2 flutes, 1 accordion) sound, and interesting tunes, including McKillop's "Reel for Maeve," a Josephine Keegan hornpipe, etc. 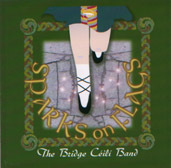 Typical ceili band accompaniment on piano and drums. One of the better recordings in this genre.